Julaksla (aka Rishaltheia) is the 2nd westernmost independent top on the Moldehalvøya peninsula. Only Gulberget above Bud is further to the west. Julaksla is located on the east side of the Julsundet sound, between Moldehalvøya and Otrøya island. 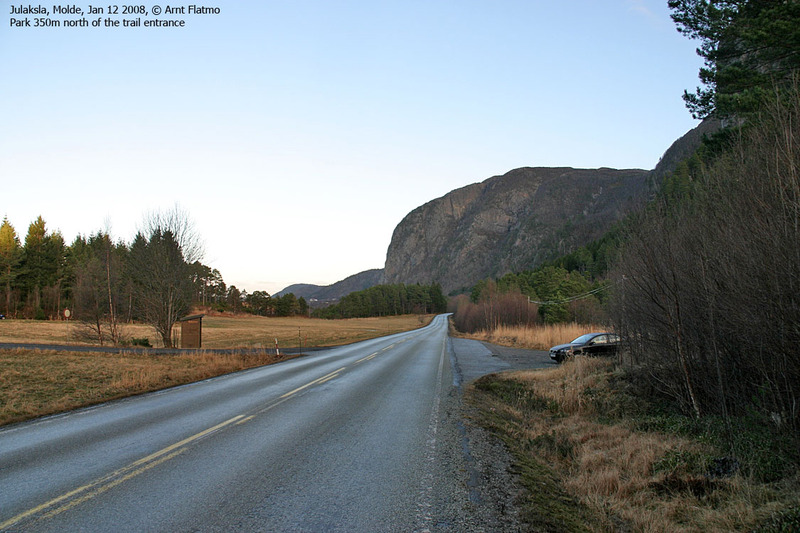 Several routes lead to the top, while this page describes a nice route from Julsundet. Julaksla is a good viewpoint. A vast number of (a.o.) Molde, Fræna, Romsdal, Vestnes, Haram and Midsund mountain tops can be seen from up here. The route described is a nice, albeit long, family hike. Kids should probably be at age 10-12 before they head up this mountain. There are a couple of steep, but not airy, sections. One of these sections has a fixed rope to aid the hiker. Should you want to extend the hike, you can always visit Eiskremheia (493m), one kilometer to the northeast. 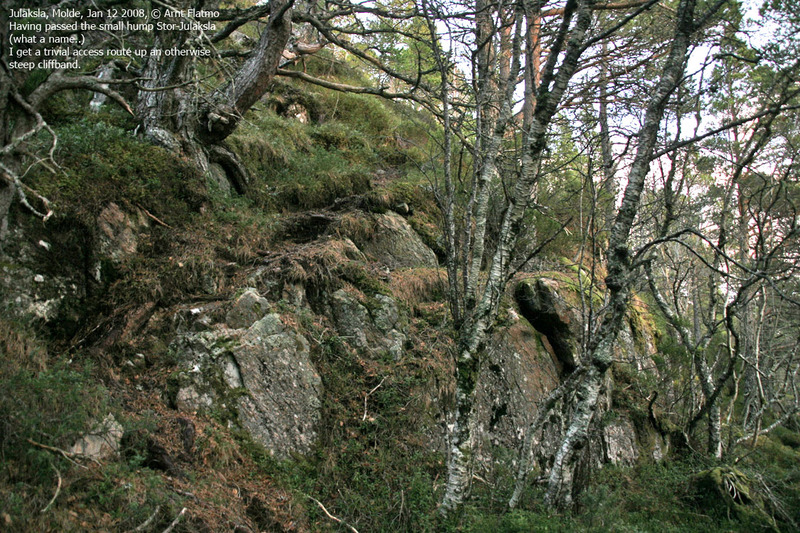 This is not an independent mountain top, but it is the highest point in Aukra kommune. Should you want to ski to Julaksla in winter, a better route is to head up the forest road along Haukabøelva river, to Lake Langvatnet, then to Lake Kryssvatnet and then north of Storheia to Julaksla summit. 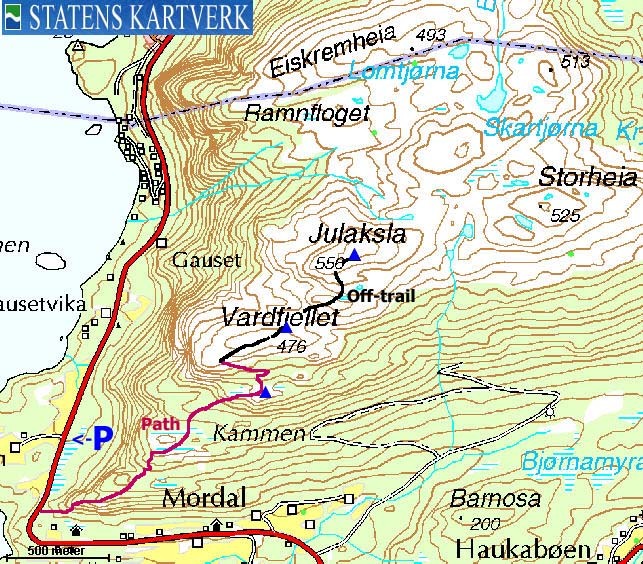 Julaksla (M711: 556m, Økonomisk Kartverk: 555,55m, UTM 32 V 398553 6958739) has a primary factor of 303m towards the higher parent mountain Seterfjellet (488m). The defining saddle (approx. UTM 32 V 402779 6960974) is found near Lomtjørna between Langvatnet and Åndalssetra. 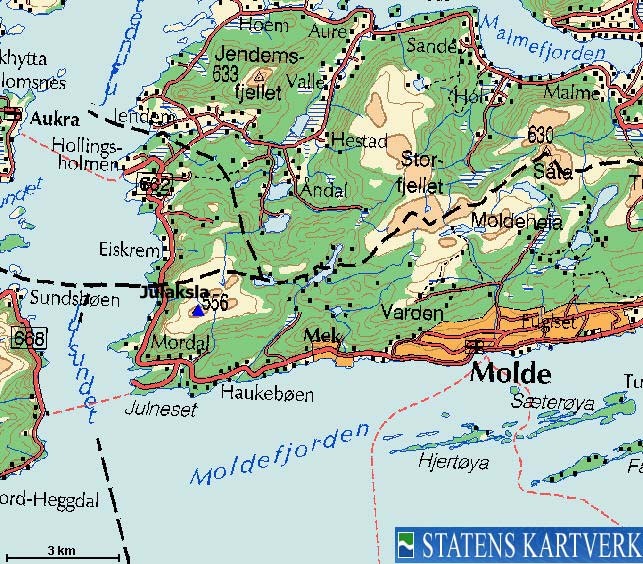 The actual saddle point is named Seterskaret (not found on the 1:50,000 map). Ref. Økonomisk Kartverk (5m contours), the saddle is within the range 250-255m, interpolated to 253m. From the city of Molde, follow highway RV662 westbound. Pass the Mordalsvågen junction and 1,8Km after this junction, just after a sharp bend to the right, notice a path on your right hand side. Drive 350m northbound and find parking on the right-hand side of the road. 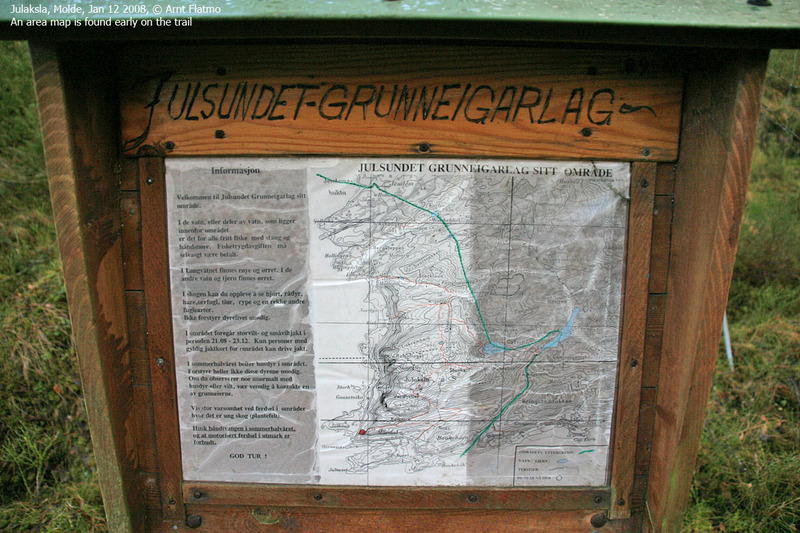 The Julaksla trailhead is approx. 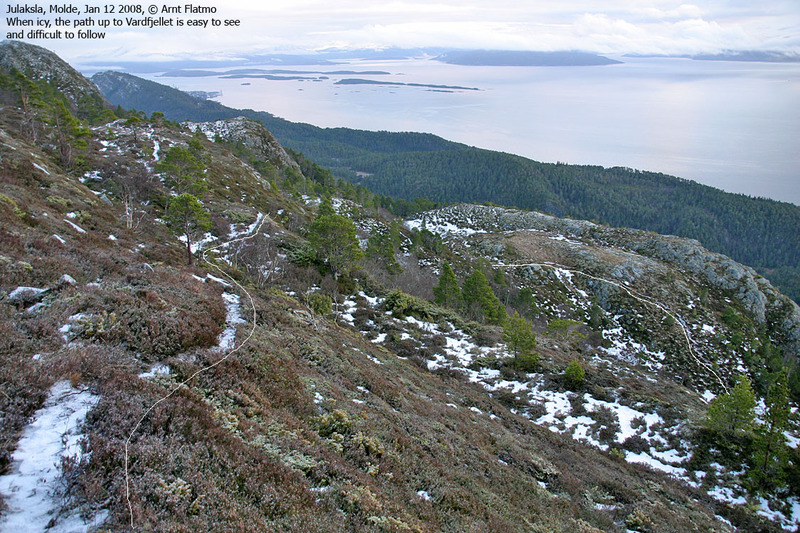 13Km from the ferry harbor in Molde, but that's on the old road through Haukabøen. 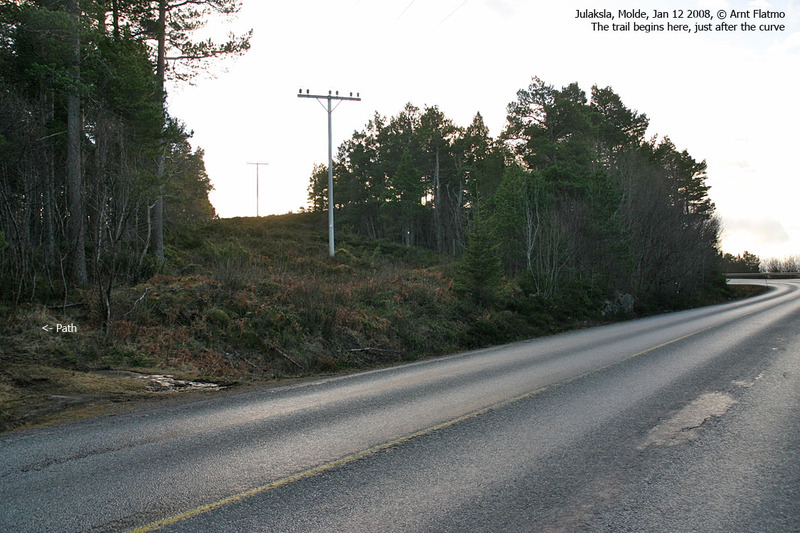 Per Jan. 2008, a new road through Haukabøen is under construction. Once you're on the forest path, you'll pass an information board that contains a map. The path described here doesn't run exactly as shown on the map. The path continues up Julaksla's southwest ridge, steep in the beginning. 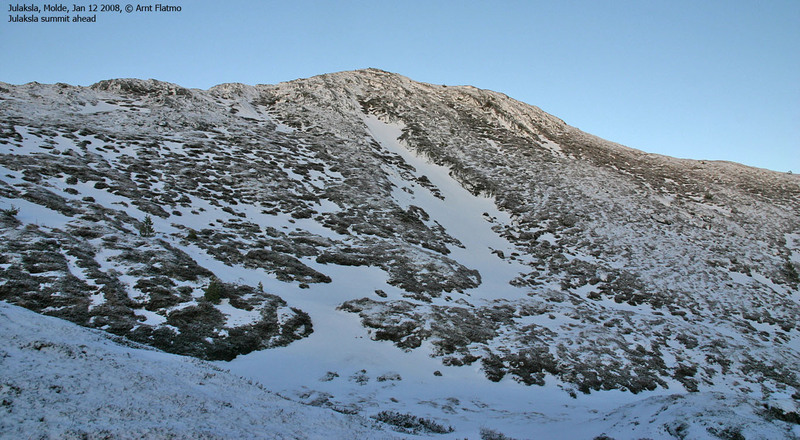 The path then curves around a hump named Stor-Julaksla (approx. 205m). 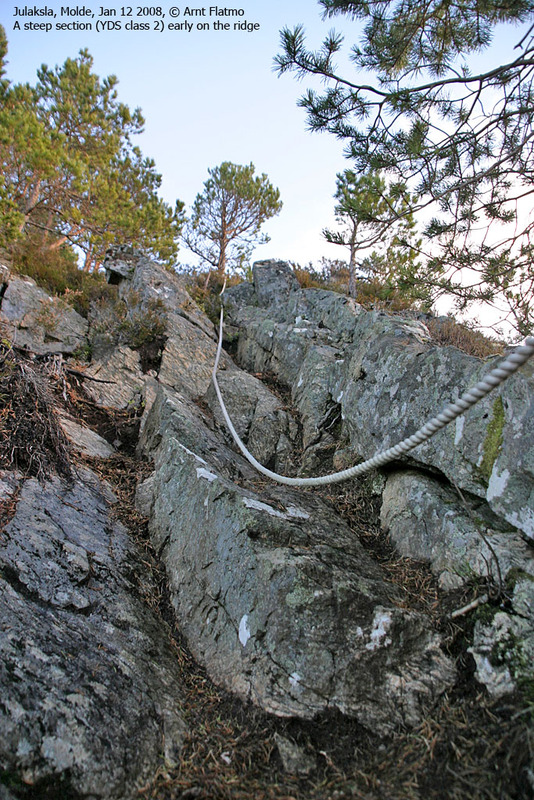 After Stor-Julaksla, you get a gentle access up a steep band of cliffs. The path now curves around yet another hump before you set course for Vardfjellet. Pay attention when you cross small meadows. The path makes sudden turns. As long as you pay attention, you will have no problems following the quite visible path. The path is also marked with occasional red paint. With Vardfjellet in front of you, you'll be heading up a ridge which is steep in the beginning. You'll enter a plateau and the first true viewpoint for the day. With the upper part of Vardfjellet in front of you, head straight for the mountain, then traverse the mountainside towards the left. Once on Vardfjellet, make a mental point on where you ascended, and proceed in the direction of Vardfjellet high point. 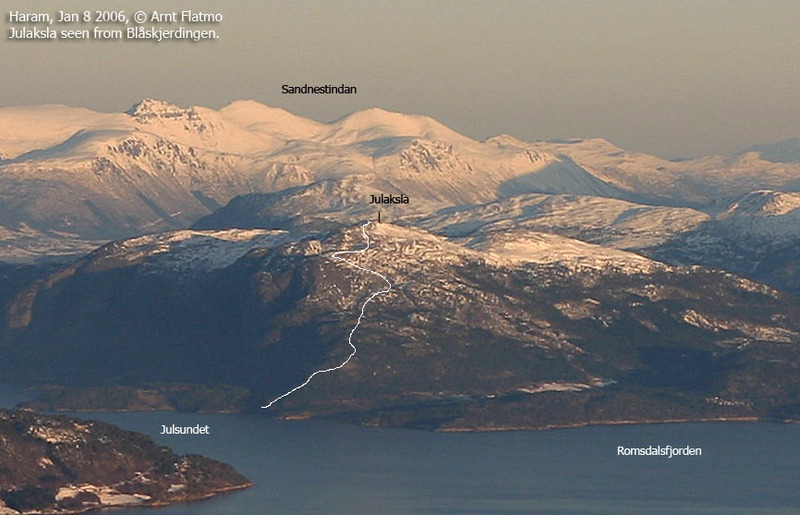 From here, you have a good overview of the further route to the Julaksla high point. The trail is not very pronounced up here, but you won't miss it much either. You'll have a few humps to cross before you take on the final hill to the summit. There are a couple of small cairns on Julaksla, but the high point cairn has (per Jan 2008) a stick.